Logistically, the day went well. The alarm went off at 3:40 AM and we were on our way to the BWI by 4:40AM after having said good-bye to Makayla and the cats. It has been a long time since I have been in an airport before 5AM. It is very quiet. Add to that, there were only about 30 people on our flight to Orlando--and the whole process of getting from home to Disney went incredibly smoothly. We had some issues checking in and getting the right rooms--but after most of the day this too was corrected. 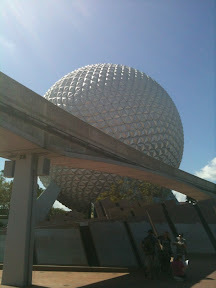 The day was an Epcot day--and we were in the park just before 11AM. 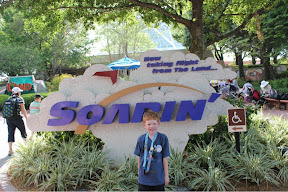 The best, by far, ride in Epcot is Soarin'. We did a fast pass for this first thing and we able to snag tickets for 4:45 PM. This ride continues to be a first rate experience and one that the kids enjoy too. We ate at the Coral Reef Restaurant--and it was our big meal of the day. The experience was truly worthwhile, eating in essentially a huge aquarium. We also did the usual Epcot stuff and had a great time and a long day. I was able to enjoy the international area around the lake.